“What’s it like to live in the Three Rivers South area?” and “What are the three rivers?” are two questions we field fairly often when speaking to potential buyers. Living in the Three Rivers area of Central Oregon offers buyers many benefits, including access to the Deschutes River, the Little Deschutes River and Spring River. With three rivers all within found within this unincorporated community in Central Oregon, residents found comfort in the stunning views and access to water-based activities. Three Rivers South offers residents a desirable lifestyle and location with a close proximity to Sunriver, Mt. Bachelor, rivers, the Cascade Lakes and the city of Bend. Roughly 20 minutes to Bend, residents can enjoy the best of both worlds — quiet seclusion with easy access to the culture and excitement of the town of Bend. Three Rivers is an unincorporated area in south-central Deschutes County. You can find this area south of Sunriver, north of La Pine and west of Highway 97. Here, the Deschutes and the Little Deschutes rivers converge. The Little Deschutes passes through the eastern part of the Three Rivers area, while the Deschutes passes through the west. Spring River, which is a short, spring-fed river, flows through the northern part of the area and joins the Deschutes from the west. Crosswater, Caldera Springs and Vandevert Ranch make up the high-end of luxury communities in the Three Rivers South area. With convenient access to Sunriver and the Deschutes River, these neighborhoods also include extra amenities to enhance your Three Rivers South lifestyle. Crosswater features the world-famous Crosswater Golf Course, while Vandevert Ranch includes horse stables, a private fishing lake and 8-miles of walking trails. Homes in Oregon Water Wonderland have the benefit of being served by its own water district, while many homes include riverfront access to the Deschutes River. Living in Oregon Water Wonderland comes as the more affordable option for residents planning to live in the Three Rivers South area of Central Oregon. Lazy River also offers affordable housing options in a more remote location in Three Rivers. Depending on where you live in Three Rivers South, your lifestyle may vary, but certain factors remain the same. 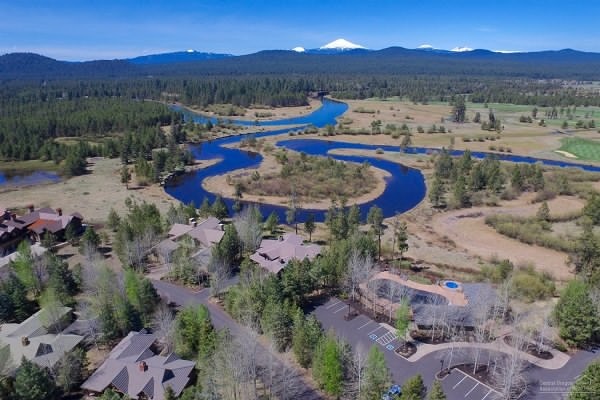 In nearby Sunriver, you can go grocery shopping, dine out at the area restaurants, pick up your mail at the post office, attend church services and drop the kids off at school. While you can take care of most of the essentials of daily life minutes from Three Rivers South in Sunriver, instances may arise where you’ll have to travel into Bend. Sunriver includes a clinic, High Desert Family Medicine, but the closest hospital is St. Charles Medical Center in Bend. For families with children considering a move to the Three Rivers South Area, students attend Three Rivers, which includes grades Kindergarten through eighth grade. For high school, students from Three Rivers South attend either La Pine High School to the south or Bend High School or Summit High School to the north. While residents have the option of shopping at one of the two grocery stores in Sunriver, many people living in the area opt to drive into Bend and take advantage of more shopping opportunities. Bend includes everything from high-end retail and grocery stores like Whole Foods and Trader Joe’s, as well as more affordable options like Grocery Outlet and Food 4 Less. Three Rivers South attracts residents with a spirit of adventure and a desire to participate in the community. Residents of Three Rivers South enjoy easy access to Mt. Bachelor and the chance to ski in the morning and golf at one of the area golf courses in the afternoon of the same day. Residents on the older end of the spectrum have found opportunities to play golf, pickleball, join quilting groups and volunteer at various organizations throughout the community such as the Sunriver Nature Center. Some homes in the Three Rivers South area include personal docks and river access, which makes the ability to enjoy the Little Deschutes, the Deschutes and Spring River a part of their daily lives. Imagine being able to watch out your back door and kayak upstream, viewing wildlife in their natural habitat while taking in beautiful views of Mt. Bachelor and the Cascade mountains. Living in Three Rivers South allows you to enjoy seasonal weather to your best advantage. In the winter, you’ll be minutes from Mt. Bachelor’s world-class ski resort as well as plenty of open space to snowmobile, snowshoe and explore the frozen Central Oregon landscape. In the summer, float the river, hike in the Cascades, discover hidden waterfalls and soak up the famous Central Oregon sunshine. For residents who appreciate the change in seasons, you’ll enjoy a real spring, summer, fall and winter when living in Three Rivers South. Residents wanting to participate in more city-centered activities can travel to Bend to catch a movie at Regal Old Mill Cinema 16 and catch their favorite band performing at the Les Schwab Amphitheater. No matter your interests, you’ll find the perfect outlet in the City of Bend. From high-end dining at restaurants like Ariana and Bos Taurus to street festivals and marathons, there’s something for everyone in nearby Bend, Oregon. Living in Three Rivers South can be an affordable choice for residents spanning a wide breadth of income brackets. Homes for sale in Three Rivers South range from $120,000 on the low end to $2,500,000 on the high end. Average home prices fall around $600,000. Residents considering a move to Three Rivers South have a variety of homes to choose from. From riverfront real estate and custom-built homes to affordable manufactured homes, Three Rivers has something for anyone hoping to make this area home. Home values fluctuate from subdivision to subdivision with homes in Vandevert Ranch, Crosswater and Caldera Springs falling on the high end. Have you ever considered living in Three Rivers South? At Tuttle and Tuttle, we’re area experts and can help you find the perfect home in the ideal Three Rivers South neighborhood. Have more questions about living in Three Rivers South? Contact us via phone or email or post questions in the comments of this blog. We look forward to helping you find your dream home in Three Rivers South.